Description: Bowling Pin Math is an awesome game where students must determine which math problems (located on the bowling pins) have answers that are greater than or less than the target number. In this way, students must evaluate ten math problems at once, rather than just the standard way of evaluating one math problem at a time. 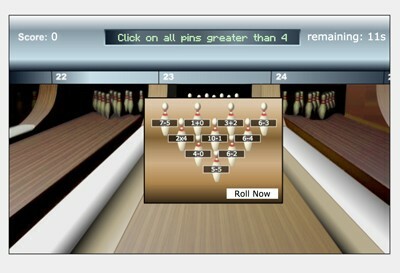 Students must bowl ten frames and score as close to 100 as possible. Description: This activity requires students to color bowling pins with equations that meet a condition. For example, "color all pins that have equations that equal more than 20." 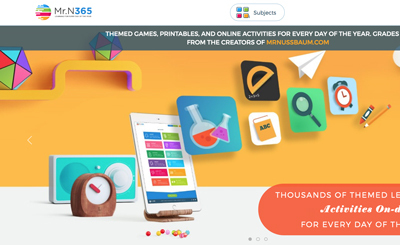 Description: This activity requires students to observe a group of bowling pins and mark the colors of those with equations that meet a certain condition. For example, "click all of the pins that have equations with answers more than 15. "